Rank and Organization: Major, 1st Vermont Cavalry. Place and date: Gettysburg, PA, 3 Jul 1863. Entered service at: Waterbury, VT.
Born: 14 Dec 1837, Waterbury, VT.
Citation: Led the second battalion of his regiment in a daring charge. Gen. William Wells, one of the best known citizens of Vermont, who was prominently spoken of last year as likely to be the successor of Secretary of War Proctor in President Harrison's cabinet, died suddenly yesterday afternoon in a William Street business house. He had come to this city, accompanied by Mrs. Wells, on a business trip, and was staying at the Windsor Hotel. 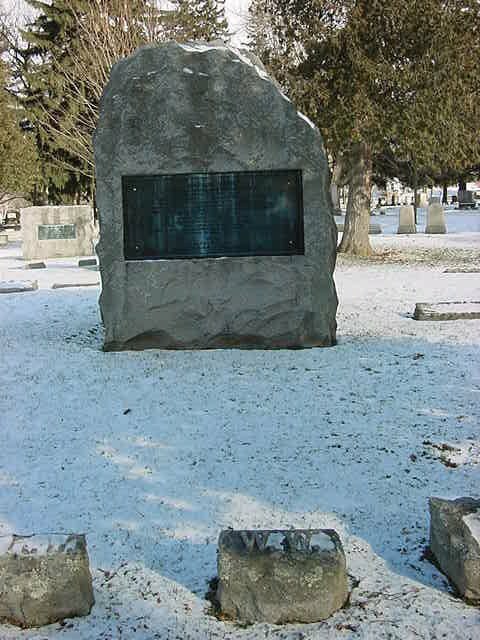 Ex-Senator Edmunds, an old friend of Gen. Wells, took charge of the body and had it taken to an undertaker's, where, at Mr. Edmund's request, it was viewed by a Coroner, who granted a permit for its removal out of town. It is understood that Gen. Wells's death was caused by heart disease. 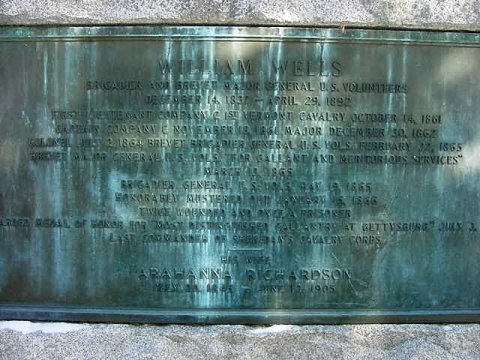 Gen. Wells was born in Waterbury, Vt., Dec.14, 1837. He was educated in the academies of Vermont and New Hampshire, and on reaching manhood became a merchant. In September 1861, he enlisted in the First Vermont Cavalry, becoming First Lieutenant Oct. 14 and Captain Nov. 18 of the same year. Oct. 30, 1862, he was made Major and took part in Gen. Nathaniel P. Banks's Shenandoah campaign and Gen. John Pope's Virginia campaign, after which he served in the cavalry corps of the Army of the Potomac. From August 1864, to March 1865, he served under Sheridan in the Shenandoah Valley, after which he returned to the Army of the Potomac. He was made Colonel of his regiment June 4, 1864; was brevetted Brigadier General of Volunteers Feb. 22, 1865, receiving his full commission Mar. 14. He was brevetted major General March 30. 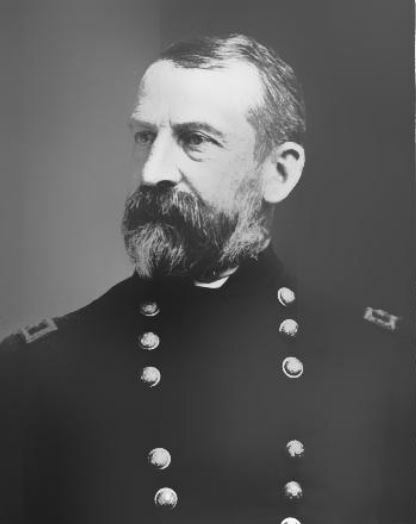 Gen. Wells commanded the Second Brigade of the Third Cavalry Division in the Army of the Potomac, and for some time was at the head of that division. After June, 1865, he commanded the First Separate Brigade of the Second Army Corps at Fairfax Courthouse. He was engaged in numerous battles and skirmishes, and was twice wounded. On Jan. 15, 1866 he was mustered out. Gen. Wells was in the Vermont Legislature from 1865 to 1866, served as Adjutant General and Inspector General for the state from 1866 to 1872, then as Collector of Internal Revenue until 1885, and as State Senator from 1886 to 1887. He was placed in command of the Seventh Regiment, Michigan Cavalry, March 2, 1864, by order of General Judson Kilpatrick, while near Richmond, Virginia, on what is known as Kilpatrick's Raid, and continued in command of the regiment for several weeks. He was in command of his regiment from June 4, 1864, as Major on Wilson's raid south of Richmond. He was in command of this regiment from date of muster as Colonel until September 19, 1864, at which date he assumed command of the Second Brigade, Third Division Cavalry Corps, Army of the Potomac. He commanded this brigade at the surrender of the Army of Northern Virginia, at Appomattox, Virginia, April 9, 1865, and until May 22, 1865, when he assumed command of the Third Cavalry Division. From September 19, 1864 to April 9, 1865, he was several times in command of the Third Cavalry Division. He was in command of the Cavalry Corps from June 1, to June 24, 1865, being its last commander. He was in command of the First Separate Brigade, Twenty-Second Army Corps, from June 24, 1865, to July 24, 1865. He was mustered out of the service January 15, 1866, by General Order 168, War Department, Washington, D.c., dated December 28, 1865. 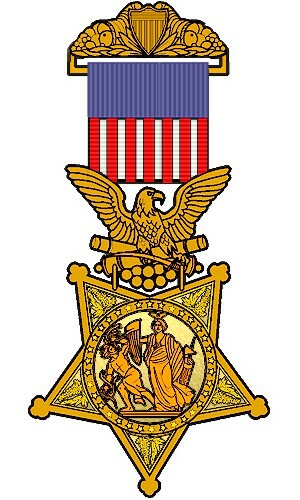 He was twice wounded, at Boonsborough, Md., July 8, 1863, with a sabre thrust and cut, and at Culpeper Court House, Va., September 13, 1863; was a prisoner of war in Libby Prison, Richmond, Va., from March 17, 1863, to about May 6, 1863. his service in the field was continuous from this muster-in until the close of the war. During his services with the First Regiment Cavalry he took part in the following battles and skirmishes: Middletown, Winchester, Luray Court House, Culpeper Court House, Orange Court House, Kelley's Ford, Waterloo Bridge, Bull Run, Warrenton, Hanover, Hunterstown, Gettysburg, Monterey, Leitersville, Hagerstown, Boonsboro', Hagerstown, Falling Waters, Port Conway, Port Conway, Culpeper Court House, Somerville Ford, Raccoon Ford, James City, Brandy Station, Gainesville, Buckland Mils, Falmouth, Morton's Ford, Mechanicsville, Piping Tree, Craig's Meeting House, Spotsylvania, Yellow Tavern, Meadow Bridge, Hanover Court House, Ashland, Hawe's Shop, Bottom Bridge, White Oak Swamp, Riddle's Shop, Malvern Hill, Ream's Station, Nottoway Court House, Roanoke Station, Stony Creek, Ream's Station, Winchester, Summit Point, Charles Town, W. Va., Kearneysville, and Opequon or Winchester. 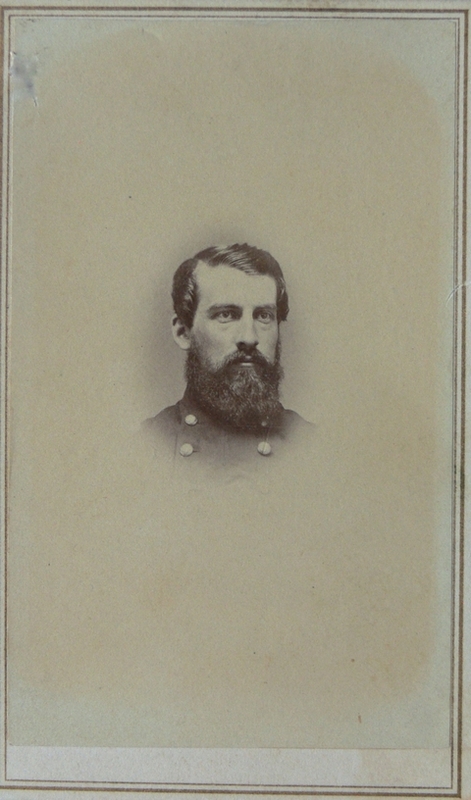 As Brigade and Division Commander he participated in the following battles and skirmishes: Opequon, Front Royal, Gooney Manor Grade, Milford, Waynesboro, Columbia Furnace, Toms Brook, Cedar Creek, Cedar Creek, Middle Road, Middle and Back Road or Middletown, Lacey's Springs, Waynesboro, Five Forks, Scott's Corners, Namozine Creek, Winticomack, Appomattox Station and Appomattox Court House. At the Grand Review Washington, D.C., May 22, 1865, he commanded the Second Brigade, Third Division Cavalry Corps, which led the advance of the Army of the Republic. Source: Revised Roster, p. 747.